Choices are decisions that your mind and body can make. No one technically can change an individual choice once they are made. What is the one wish your body or mind wants to make? 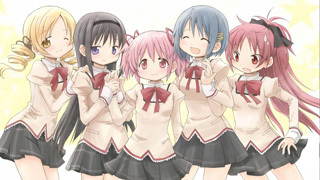 Do you choose to be a magical girl? Are there going to be repercussions? Is it all glitz or glamour? Do you want to make a contract with a cute bunny-squirrel-cat-esque creature? 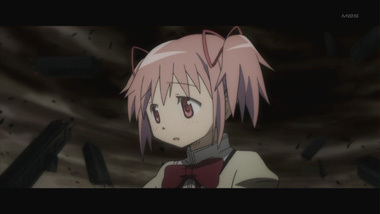 These are questions that Madoka faces when she gets the choice to be a magical girl. 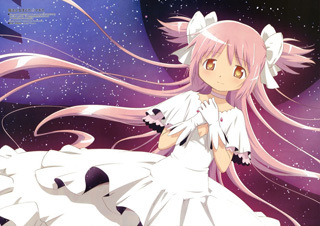 Unlike Sailor Moon or every other magical girl story a person can think of. 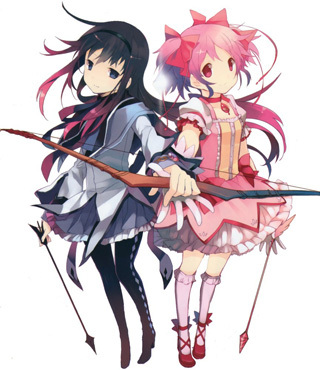 Puella Magi Madoka Magica has a sinister edge showing the dark side of what can possibly happen if a girl becomes a magical girl and battles witches. 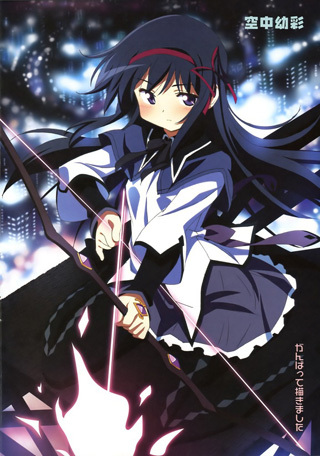 A magical girl in concept is supposed to be glittery, pretty and a heroine of justice, but with human nature, the good and evil, greed, jealousy, ill-will or desire, these culminate into beings known as witches. Anime.com has reviewed the anime, which is available streaming through Crunchyroll, or retail through Bandai. 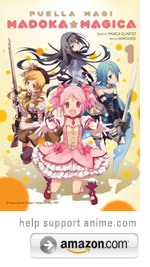 Yen Press has licensed the manga series, which is three volumes in length and produced after the television series aired. So for readers new to this series, it is a philosophical concept that definitely bears thinking about; is the road to hell paved with good intentions or is it a matter of choice? 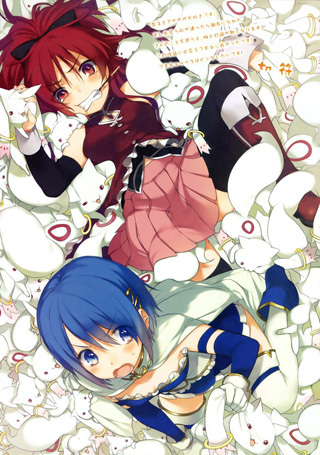 Another read-alike series that has this similar choice concept is Bokurano Ours, or Future Diary. 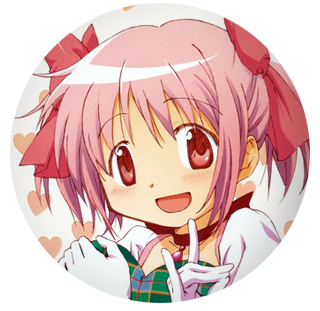 Now that Puella Magi Madoka Magica (or Madoka for short) has finished airing, the debate begins: Was Madoka a complete deconstruction of the magical girl genre, leaving an unmistakable mark on the exploits of these pint-sized superheroines, now and forever? Or was it just an innovative magical girl series, refreshingly free of all the filler and predictable conventions magical girl fans have come to expect, but no more than the sum of its parts? 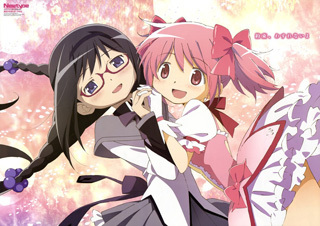 Time will tell, but either way, anyone with even a passing interest in either magical girl shows- actually, strike that, anyone interested in anime PERIOD-needs to watch it pronto; it's well on its way to making that short list of shows that every anime fan worth their salt needs to have seen to keep up appearances. 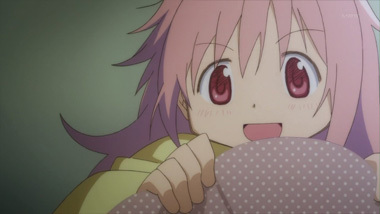 If you don't see it soon, steel yourself for a barrage of outraged "What do you mean, you haven't seen Madoka?!" exclamations. Fortunately, for the non magical-girl inclined, most of the things that typically annoy or bore viewers about the genre are nowhere to be found here. 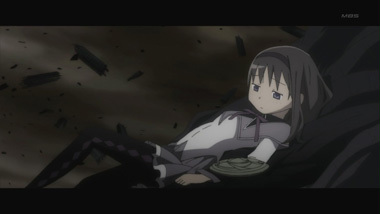 Instead of the syrupy sweetness found in many if not most shows in the genre, the world of Madoka is harsh- almost oppressively so, but it's done with enough finesse that it never feels like the show is being dark just for the sake of it. With one or two partial exceptions, there are no stock animations or stock attacks; every battle is distinct. Perhaps most importantly, clocking in at a taut twelve episodes, with no filler to speak of, it avoids the repetitive "monster of the week" formula that most shows in the genre fall into. 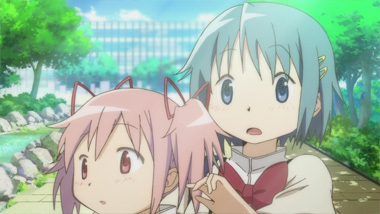 In fact, as opposed to having a formula, you never know quite what's going to happen in Madoka, which is perhaps the show's greatest selling point; it's one of those series where you feel genuine anticipation for the next episode, because you can't imagine where things are going to go. 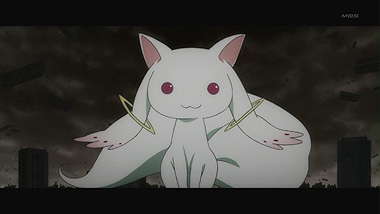 It's the witches' barriers that give Madoka much of its distinctive visual flair; these alternate dimensions, which channel far more Hieronymus Bosch than Sailor Moon, really need to be seen to be believed. 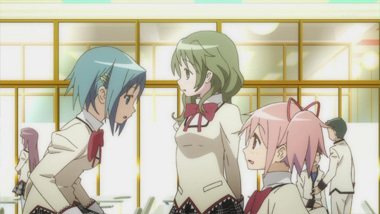 The show takes an interesting approach to design in general; while the character designs are reminiscent of many other popular anime starring girls in this age bracket (Hidamari Sketch immediately comes to mind), the non-magical world of Madoka is remarkably clinical and sterile looking; in fact, the stark architecture, reminiscent of a real city but just slightly askew, is in its own way more disturbing than the barriers. The non-magical world seems remarkably cold, while the magical world of the barriers absolutely pops with color and life; however, real danger lurks around every corner. Speaking of which, though the promo art for the series might give you the impression that its meant for little girls, that couldn't be further from the truth; it's too dark, with way too much death and destruction for children. While there's very little gore, the psychological horror of many of the situations calls for an adult audience. 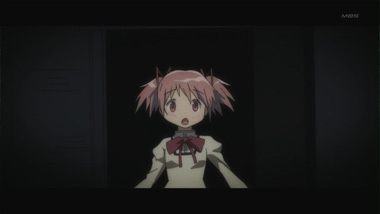 However, because so much of the horror is implied, how scary or depressing you find Madoka probably has as much to do with the expectations you bring to it as the show itself. Of course, the show's not perfect; frequent inconsistencies in the character design have been the source of quite a few jokes among fans. 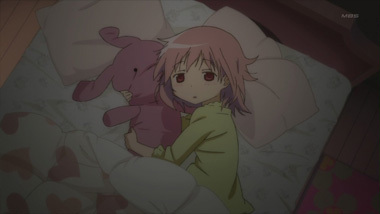 Some complain that the titular character, pink-haired Madoka, often seems more like a bystander in her own show, especially early on. However, a lot of the aspects that some may consider flaws were likely deliberate choices that complement other aspects of the show. It's probably worth noting that the show puts plot ahead of character, early and often- some may be bothered by the apparent lack of depth from certain characters, but the novelty of such a strongly plot-driven show in this genre does make up for it quite a bit. Also, on a minor note, physics buffs may be annoyed with one or two aspects of the plot- either the characters or the writers didn't completely understand what they were talking about at a few points, but it's largely academic. 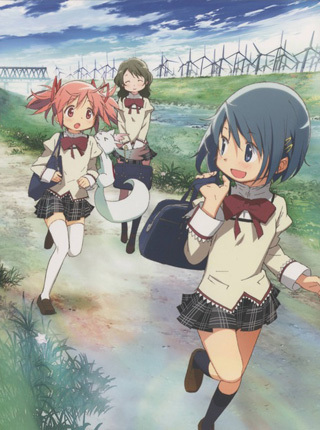 If nothing else, Madoka proved that it was possible to breathe new life into a genre that many felt had grown stale- whether it was a true deconstruction or not, it was definitely a magical girl show the likes of which we had never seen before. You may find yourself wondering what other fresh, exciting shows could be made if anime writers would take all our favorite genres, and look at them from a slightly different perspective. 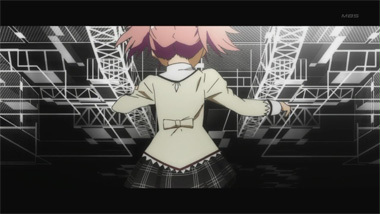 We can only hope that the creators will see that challenge as well, and rise to the occasion- and if so, what a legacy for a humble, pink-haired school girl. 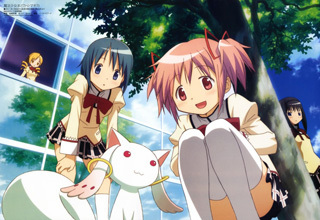 Below: Scenes from Puella Magi Madoka Magica. 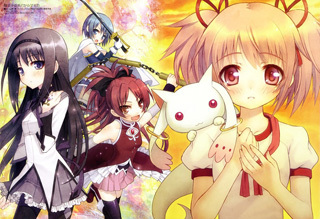 Below: Promotional illustrations for Puella Magi Madoka Magica.